The St. Louis Cardinals have 19 games left in the 2013 regular season. After successfully completing a sweep of the Pittsburgh Pirates, St. Louis sits atop the National League Central–1.5 games up on the Pirates and the Reds. Game 1 starter, Wily Peralta, has an 11.57 ERA in two starts against St. Louis this season. Game 2 starter, Marco Estrada, has an 8.14 ERA in four starts against St. Louis this season. Game 3 starter, Tyler Thornburg, has not faced St. Louis this season, but he is right-handed, so the team at least has that going for them. Because of an injury, the Cardinals lucked out and will not have to face King Felix Hernandez this series. The last three starters–Joe Kelly, Adam Wainwright, and Michael Wacha–have had three straight quality starts. Combined, the three pitched 20 innings and allowed just one earned run. Let’s hope Lance Lynn can take note, or else his rotation spot may be in jeopardy. Since being re-inserted into the starting rotation, Kelly has won eight straight decisions. 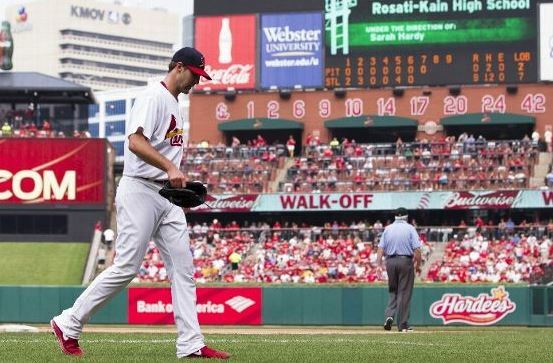 Since taking over the spot vacated by Jake Westbrook, Wacha has looked like he deserves a spot in the playoff rotation. Trevor Rosenthal has not allowed a hit in his last four appearances (5 innings), while he has compiled seven strikeouts and zero walks. Kevin Siegrist has not allowed an earned run since July 30th and has lowered his season ERA to a minuscule 0.56 in 32 innings pitched. The offense seemed to figure something out against the Pirates–averaging nearly nine runs per game in the series. With favorable match-ups ahead, look for the offense to stay hot. David Freese increased his season home run total by 33% (up to eight in 2013) with two home runs in the past four days. He is five for his last twelve and just may be heating it up when it matters most. Matt Carpenter is hitting .379 in his last seven days but only has two runs batted in during that span. If only the lineup was configured in a way to get runners on base with him at the plate. Jon Jay has 63 RBI in 2013–just three behind Reds’ slugger, Joey Votto. The Cardinals are grateful to have 12 of their remaining 19 games at home. They also won’t complain about their remaining schedule, either. While the Cardinals are playing very beatable opponents, the Reds and Pirates will be beating up on each other in six of their last nine games. The Reds are hot, 7-3 in their last ten games, and just finished a sweep of their own against the surging Los Angeles Dodgers. Yet, the Cardinals, ahead by 1.5 games with an easy remaining schedule, have the upper-hand in winning the division. 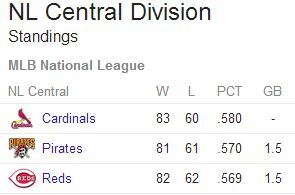 I honestly think that the division will come down to the Cardinals and the Reds, with the Pirates trailing off in the final three weeks of the season. Given what remains for the Cardinals, it would be a disappointment to not come away with the division crown in 2013. The Reds drew a total of 44,113 fans for games two and three of the series against the Cardinals. On Saturday against the Pirates, the Cardinals had 45,110 in attendance. Thus, in one game, the Cardinals had nearly 1,000 more fans than the Reds had in attendance for two games. Sure, this is comparing a weekend game to two weekday games, but still, you would think they could do better, especially against a heated rival. The Reds are in a playoff race aren’t they? This entry was posted in St. Louis Cardinals, United Cardinal Bloggers and tagged National League Central, NL Central, Playoffs, St. Louis Cardinals by stlcupofjoe. Bookmark the permalink.